Arsenal responded to their exits from both the Champions League and FA Cup with a comfortable victory over Everton at Goodison Park. Danny Welbeck opened the scoring on seven minutes, put through by Alexis Sanchez to round Joel Robles and slot home for his fourth of the season. On 42 minutes, teenager Alex Iwobi marked his maiden Premier League start with a first goal for the club. The result leaves the Gunners 11 points behind leaders Leicester City. It was a first win in four league matches for third-placed Arsenal, who dominated the game. In contrast, Everton failed to test their opponents properly and had just two shots on target as their dreadful home form - now four defeats in five in the league - continued. Arsenal began the week with a 2-1 home defeat by Watford in the quarter-finals of the FA Cup being knocked out of the FA Cup. Then on Wednesday they lost 3-1 to Barcelona at the Nou Camp as they were knocked out of the Champions League. With only the league to focus on, this looked like a must-win match for the Gunners if they were to stay in touch with Leicester. There are also not yet assured of a Champions League place with fifth-placed West Ham only three points behind before kick-off. In the event, they responded to last week's disappointments with a positive performance and earned a first league win since beating Leicester 2-1 on 14 February. It was a dream full league debut by Iwobi, the 19-year-old Nigeria midfielder. He has come through the ranks at Arsenal's Hale End academy and made his first-team debut in October's 3-0 League Cup defeat by Sheffield Wednesday and signed a new contract last year. Iwobi was born in Lagos but played for England's youth teams before deciding to represent Nigeria and has won two caps for the Super Eagles. He boasts footballing pedigree as his uncle is former Bolton and Nigeria legend Jay-Jay Okocha. Iwobi was brimming with confidence in attack and had the most shots of any of his team-mates. He linked well with Welbeck and showed composure and strength to hold off the challenge of Ramiro Funes Mori before scoring his goal. Everton have now won just one of their past nine Premier League games at Goodison Park. They have the league's worst defensive record at home, conceding 28 goals - already the most they have shipped in a 38-game Premier League season. The Toffees' record is worse than bottom club Aston Villa, who have let in 25 at Villa Park. They have kept only two clean sheets at home in the league this season and their Goodison Park record reads: played 16, won four, drawn four, lost eight. The fans were audibly frustrated at their team's poor form and the home defence was exposed horribly by Hector Bellerin's well-flighted pass for Iwobi's goal. Manager Roberto Martinez changed formation at half-time, bringing on defender John Stones for midfielder Muhamed Besic and switching to a back three. The change worked as Everton looked more compact in the second half, but they rarely threatened a comeback. Arsenal manager Arsene Wenger: "It was a very significant win for us and a mental test. We continued the level of performance against Barcelona. "I like this group, I like the mental attitude - it has been questioned and it hurts me. "When you work every day with them you see how much effort they put in." Everton manager Roberto Martinez: "We were second best. I thought Arsenal had more bite and intensity. "It was so disappointing, the contrast in performance from last Saturday [the 2-0 FA Cup victory over Chelsea] is difficult to explain. "We never got a platform into the game, we were ineffective, we had second thoughts in every action and Arsenal were, in every single aspect of the performance, better than us." Arsenal enjoyed only their third victory in their past 10 away Premier League games (drawn four, lost three). Welbeck has now scored four Premier League goals against Everton, his joint-best return against any side (along with Aston Villa). Iwobi scored on his first Premier League start, the first Arsenal player to do so since Joel Campbell in October. Bellerin has provided three assists in his past two Premier League games after managing just two in his previous 46. The Premier League takes a break for international football and Arsenal do not play again until 2 April when Watford visit Emirates Stadium. Next for Everton is a trip to Old Trafford to face Manchester United on 3 April. 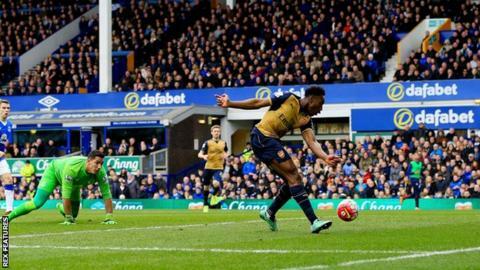 Match ends, Everton 0, Arsenal 2. Second Half ends, Everton 0, Arsenal 2. Mohamed Elneny (Arsenal) wins a free kick in the defensive half. Attempt missed. Olivier Giroud (Arsenal) left footed shot from the left side of the box is close, but misses to the left. Assisted by Calum Chambers. Corner, Everton. Conceded by Mohamed Elneny. Aaron Lennon (Everton) wins a free kick in the attacking half. Attempt saved. Romelu Lukaku (Everton) header from the centre of the box is saved in the centre of the goal. Assisted by Ramiro Funes Mori with a cross. Substitution, Arsenal. Calum Chambers replaces Alex Iwobi. Corner, Arsenal. Conceded by Seamus Coleman. Corner, Arsenal. Conceded by Phil Jagielka. Attempt blocked. Olivier Giroud (Arsenal) left footed shot from outside the box is blocked. Kieran Gibbs (Arsenal) wins a free kick in the defensive half. Substitution, Arsenal. Kieran Gibbs replaces Mesut Özil because of an injury. Delay in match Mesut Özil (Arsenal) because of an injury. Substitution, Everton. Gerard Deulofeu replaces Ross Barkley. Attempt missed. Tom Cleverley (Everton) right footed shot from the right side of the box misses to the left. Assisted by Aaron Lennon. Attempt missed. Phil Jagielka (Everton) with an attempt from the right side of the six yard box is close, but misses the top right corner. Assisted by Tom Cleverley with a cross following a corner. Corner, Everton. Conceded by Nacho Monreal. Attempt missed. Francis Coquelin (Arsenal) right footed shot from outside the box is too high. Francis Coquelin (Arsenal) wins a free kick in the defensive half.